College readiness means knowing how to solve an algebraic equation, but it also means knowing how to set an alarm clock. That’s the advice of Jim Montoya, former dean of admissions at Stanford University and now president of higher education relationship development at the College Board, which runs the SAT college admissions test. In an interview with Bridge, Montoya discussed the need for a holistic approach to college preparation that goes beyond standardized tests. Bridge: What’s your view on the state of college readiness today? A: Only 39 percent between the ages of 25 and 34 have a college degree. We at the College Board set a goal to get that number to 55 percent by 2025. That will require more students to be more prepared. Some students are better prepared than any students we’ve seen in past generations. But as we see larger numbers of students going on to college, we see a greater disparity. We’re in a situation where too many of our students are taking remedial courses and not finishing their freshman year. Bridge: What can they do to better prepare their students for success in college? A: What we know is across all socioeconomic lines and ethnic lines, the student who takes the most rigorous courses does better on the SAT, and by doing better, suggests they are going to be better prepared to be successful in college. 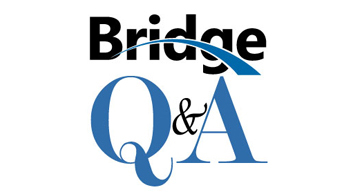 Bridge: Does an ACT or SAT score tell whether a student is ready for college? A: College readiness is driven by many different factors. Academics is an important component, (but) a single test score is not going to tell the full story. There’s also personal maturity -- the understanding of what one has to do to be successful, the ability to work more independently, knowing they’re not going to have the same level of guidance. Bridge: You mention maturity. Is that the intangible that impacts college readiness? A: The focus needs to be academic preparedness, but there are other aspects. If I were a parent, beyond just the SAT score or GPA, I’d be asking about, or helping my student think about, the transition in terms of the independence, the decisions they’ll have to make, the level of resourcefulness they’ll have to have to knock on doors of faculty. There’s a work ethic needed, without Mom or Dad being there asking if they’ve finished their homework. Bridge: Do college admissions officers look at anything beyond test scores? A: It depends on the university. There are some universities where the admissions is driven by academic achievement, as measured by the rigor of courses they’ve taken, grades and test scores, and you have that information in front of you. But other institutions take a more holistic approach to college admissions. Some (rely on) essays and answers to short questions, interviews, letters of recommendation. There are students I’ve admitted whose test scores might not have captured the potential they have. It may be that the student was working 25 hours a week and that impacted his ability to get an A instead of a B.
Bridge: What’s a common mistake high school students make? A: The use of the senior year. The pattern is students fulfill their requirements by their junior year, and don’t use their senior year in an effective way. Senior year is the year they need to most push themselves. The senior year is so important in terms of the student being prepared on the first day of class to be successful. For the student who is choosing not to go on to college, that makes the senior year even more important in terms of taking courses that will serve them well in their career. Bridge: How do we move the needle on college readiness? A: In order to get 55 percent of young Americans to have a college degree by 2025, we’re going to need to increase the number of Latino students who are prepared to go to college. About 39 percent of young Americans have a college degree. Given demographic changes, if groups continue to go to college at the same rate, only 29 percent of young Americans will have a college degree by 2025. And, already, we know the 39 percent falls below what it needs to be. A lot of intervention needs to be done. Bridge: What tips do you have for families with kids entering high school? A: Take four years of English and four years of math, even if only three years are required. As much as possible, we need to keep doors open. What parents don’t realize is doors are closing in 10th or 11th grade because they’re not choosing the right courses. Bridge: If you had just a few words of advice to students and parents trying to get ready for college, what would they be? Human evolution has not taken a sharp nosedive. Humans are producing, proportionally, the same ratio of bright/dim bulbs as we ever did. What we're doing is diluting the college pool by sending too doggone many of our offspring to four-year institutions, when most should be in community college, learning career-specific skills (and perhaps--a big perhaps--some entry-level core classes). If we want to raise the general level of maturity of our young people, the best thing we could do for all 18 year old kids would be to enact a mandatory two-year national service program (after a short physical training program, opt for civilian or military flavor, but even the civilian track is run along military lines). Enact a new G.I. bill; two years of service equals two years tuition at a community college. And if colleges want a higher-quality college student, they'll have to drop the silly open-admissions policies--that's for community colleges. Next, they'll have to shrink their business to fit the number of kids who actually belong in 4-year institutions, which at most is about a third of high school grads. Universities have been on a growth binge for 20 years and it's about time they did some right-sizing. I hate to have to say this, but what Mr. Montoya said was said 50 years ago. What is different is that it simply isn;t college degree any more, so many can get them, it is about what kind of degree, what does the degree prepare them for and how much will the employer have to invest in them to make them productive. Scores do matter, it reflects what has been learned and it the person has the capacity to learn. What needs to change is how collefe made relavent to the kids. The maturity issue is important, are the kids ready to manage thier time and understand there responsibilities. K-12 can help by making them holding them more responsible as they get older not less so as they do today, in our local district the classrooms in high school are more disrupted by students than in the lower grades, does that teach maturity? College preparedness in not about ethinicity, about gender, about lifestyle, it is about the individual and their choices. You want more of one group or another all you have to do is what UM did make special adders for the target group so they can enter even if not prepared nor able to graduate. College isn't the end, it is only a stepping stone for life. To bad Mr. French cold see past getting to college as the success, he might of ask how is college doing in those areras.